Thank you all for the great comments, i really appreciate your support and the fact that you like my demon :). I have to admit however that i'm getting tired of him. While he may look cool at first, he is really really generic. While that woundn't nececarily be a problem, i want to push my limits and create somethign more 'special' and unique for the competition. This guy is certainly no 'King'. So i think i'll change my subject to 'Nightmare Lord'. It's something different and leaves a lot of room for imagination >:). Man, I love your drawing and your stylization of anatomy, threw you a follow on ArtStation. The new version is definitely cooler, nice to see it pushed in a more interesting direction. Glad you like it @kimsokol :). And thanks a lot for the follow! Yeah, I get what you're saying. The old version had more of an enemy vibe rather than a boss vibe. I hope you plan on keeping those bold colors though. They suit your style very nicely. Another Nightmare Lord sketch. Trying out different ideas. Personally, I like the one from yesterday more. Good to see you still exploring with different ideas. Currently the second iteration might be my favorite. I like the idea of the chains from the 3rd version. It gives this "just release" boss character vibe. He has a resurrection vibe as well. But of course it's up to you. You have nice elements in each. Hey dude, this concept is so cool! I like your style! This is my favorite! Awesome. Can`t wait to see more! Thank you all for your comments and feedback it was really helpful so far :)! 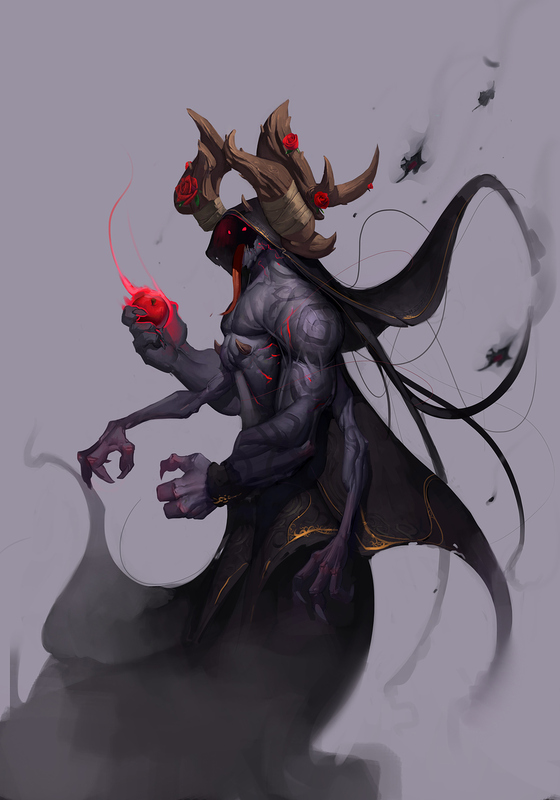 Looks like most of you prefer the 1st version of the nightmare lord so i went with it and started rendering. I actually pushed it quite far, i should have posted more updates :/. I was fairly happy with how it was going so i got caught up in the process and i forgot to save progess pictures. That been said he is still in progress and any feedback would be greatly appreciated :). 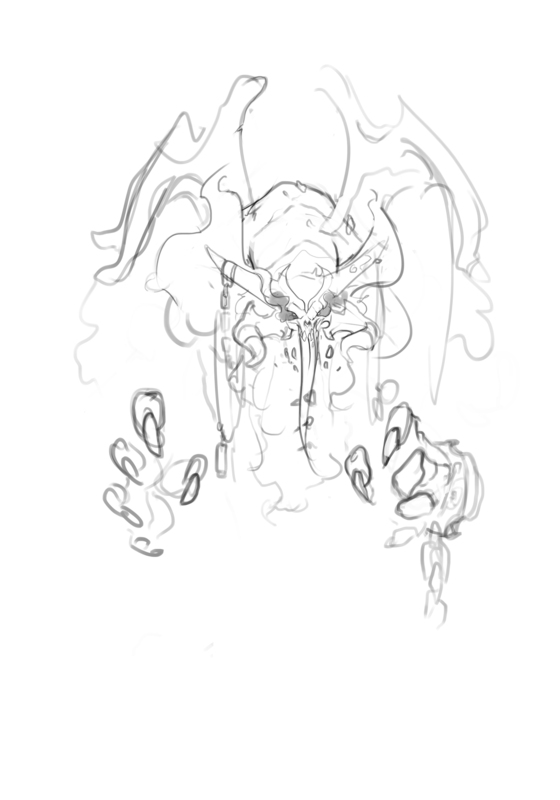 As for my thought process, even tho he is a 'Nightmare Lord' i didn't want to make him disturbing or disgusting. I feel like nightmares do not always involve gore or death. In fact for most people they rarely do. So instead i went for more fairy tale or dream like qualities such as roses,thorns and the apple. OMG!!! It's so badass! Amazing work man! dyaum boiii this is badass!!!! You went from lvl 90 to lvl 1,000!!!!!!! WHAT'S THE POINT IN COMPETING ANY MORE???? You're just going to win all of the top places and all of the prizes. @rgdraw @eissa @Trevor_Truscott Thank you all for your support it really means a lot :). @glubglubz Thanks haha xD! No way i'm good enough for one of the 1st spots but i appreciate the kind words regardless :D.
The main concept is almost done so it's time to focus on the illustration. Oh boy, there's not really much time left. Not even sure if i can make it but it's sure gonna be fun. 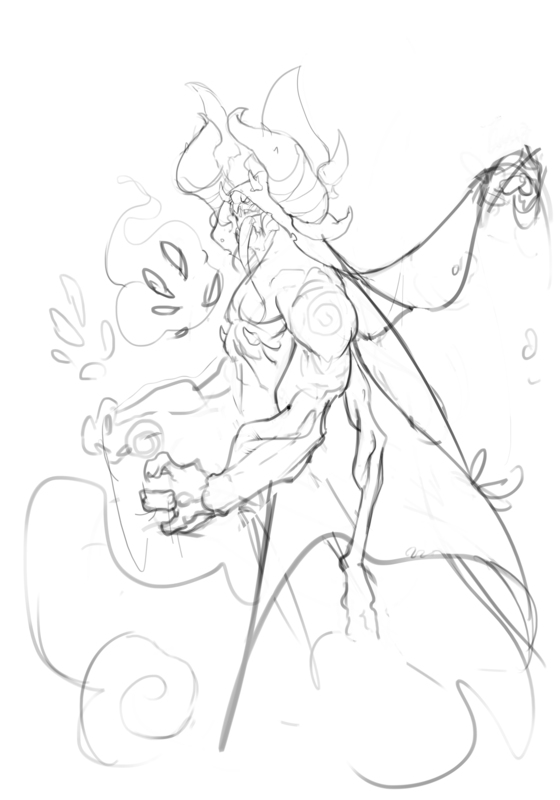 Anyway i was thinking of having the Nightmare lord chilling in his realm surrouned with various nightmare bats (creatures he forms out of his own etherial body). Bats are one of the few creatures that are related to dreams or nightmares so i feel like they would make intesting allies for him.